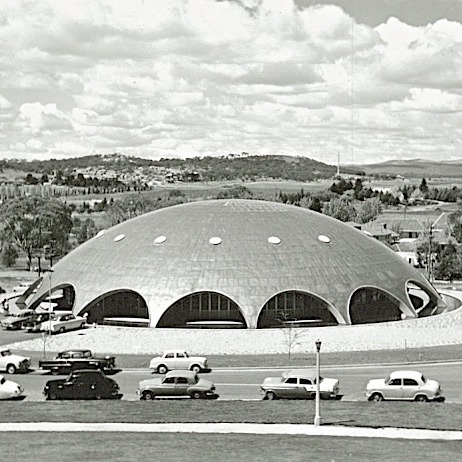 Formerly the Becker House, the Shine Dome stands as one of the most iconic pieces of daring mid century Australian architectural design, heritage listed in 2005 for its bold fusion of unique construction methods – a 710 tonne poured concrete shell – with a new age form – a dome with 16 slender supports that slide into the ground. Six influential architects of the time were invited to submit a proposal for the Australian Academy of Science building, with a shortlist that included Boyd, Romberg and Grounds – the latter of which whose design later won the commission. A building with endless elevations, the Dome provides a 360° view on the surrounding landscape (completed before Lake Burley Griffen came into being), framed elegantly between the supports that create small contextual vignettes as you round the glass line between a perimeter water feature and a vast interior including a 150 person lecture hall.